The Economic and Financial Crimes Commission (EFCC) has traced about N1.4billion allegedly belonging to the Akwa Ibom State Government to 11 suspected slush accounts. The cash was remitted into the accounts in two tranches of N1.1billion and N300million,The Nation gathered yesterday. Some of the accounts belong to eight top lawyers in the country. Sources said yesterday that they might be interrogated soon. One of the suspected lawyers has made a statement to the EFCC on how he came about the huge transfers into his account from the Akwa Ibom State Government accounts. The suspect, according to sources, told detectives that the deposits were legal fees for 16 cases. He could not produce documentary evidence of any agreement between his team and the state government. Detectives were said to be curious that the alleged legal fees were paid into the 11 accounts in cash as against the standard practice of paying with cheque. It was also gathered that one of the accounts which was opened on March 16, 2016 had a huge deposit record on March 14, 2016. The anti-graft agency has already invited four officials of the state government for questioning on the issue. They are: Commissioner for Finance, Nsikan Linus, the Permanent Secretary and Director of Finance and Accounts in the Ministry of Justice , and an Assistant Chief Accountant in the Accountant-General Office in the state, Mfon Jacobson Udomah. They have all refused to honour the invitation without any valid reason. The fact-sheet of the case sighted by The Nation showed that N1.4billion was remitted into the various accounts as follows: N135m; N120m; N100m; N60m; N60m; N65m; N570m; N75m; N75m; N75m; N30m; and N45m. Investigators said: “There was no document tied to specific payment. The deposit also did not specify what the cash was meant for. “There was no evidence of any agreement between the state government and the beneficiaries of the N1.4billion. The lead coordinator of the lawyers who benefitted from the cash could not say how much was charged and how much was agreed upon. “The lead lawyer only said the cash was for 16 cases in various courts across the country but only a case was reflected as having gone from the lower court to the Supreme Court. 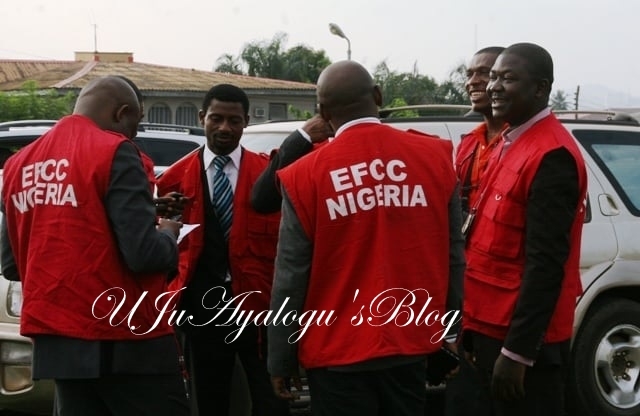 The EFCC is insisting that the four officials must report for questioning. A source familiar with the matter said: “Letters of invitation were written to the Permanent Secretary and Director of Finance and Accounts of the Ministry of Justice of Akwa Ibom State on June 8, 2018 and the Commissioner for Finance and an Assistant Chief Accountant in the Accountant-General Office in the state on July 13, 2018. “They were to be questioned in Abuja. They all failed to report despite sending reminders to them on July 3 and July 13. We later sent a team to interact with them at the EFCC’s Uyo Zonal office but they refused to meet with our operatives. “The EFCC’s team from Abuja travelled to Uyo on July 19 and on July 20, our operatives requested to invite the affected state officials. None of them came around. “The Secretary to the State Government and the Attorney-General and Commissioner for Justice wrote an undertaking in Uyo Zonal Office and Abuja respectively assuring the EFCC that the invited persons would report as requested but they failed to turn up.